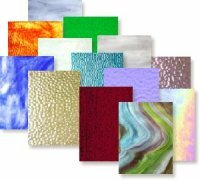 Our Dichroic Glass section has been completely updated with new sheet glass selections, Crinklized coatings plus frit, stringers and more! Bright, sparkling and easy cutting. All bevels may be purchased as single pieces or save 25% and buy in boxes of 30 bevels, all the same style. See our selection of the highest quality faceted jewels. Our jewels are made in Europe - no seconds, no cheap Asian imports. Mika International has many traditional and innovative designs, all reasonably priced. GST Publications has the most imaginative bevels Whales, Dragonflies, Fish, Horses - all done with the most imaginative design sense of any bevel series. 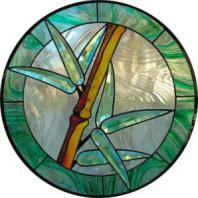 We have yet to get the 1200+ colors of glass we stock up on our on line store. While we aren't set up to sell them on our web site, we can fill your glass needs. Special glass needs? Got to have the swirls mild or wild? Just ask. Our warehouse staff will search for just the right sheet for you. 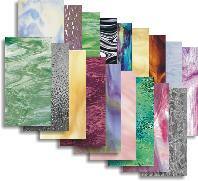 CLICK HERE to go to our Glass Sample Set Page. We offer sample sets to let you see the glass up close. Our web images are good, but nothing beats having a sample of the glass in question in hand when making color decisions.